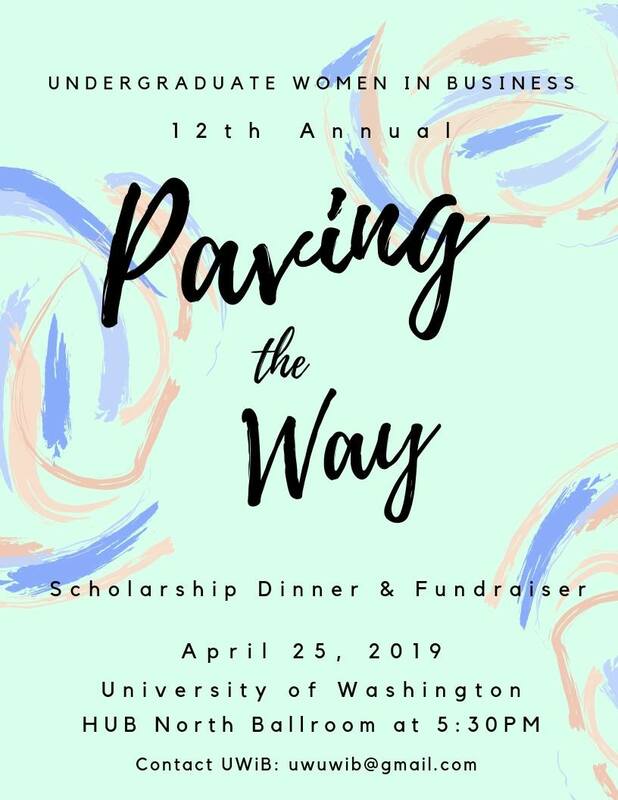 On April 25th, 2019 Undergraduate Women in Business will be hosting the the 12th Annual Paving the Way Scholarship Fundraiser. 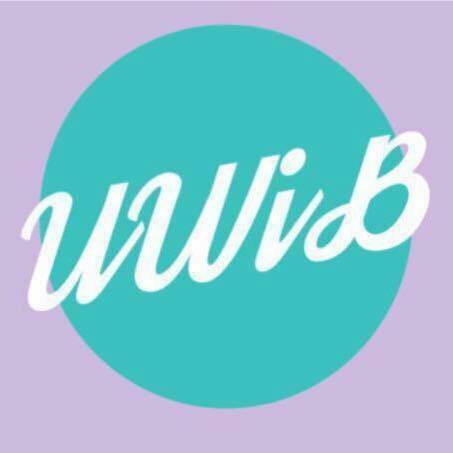 This event takes place in the North Ballroom of the HUB at the University of Washington, giving attendees the opportunity to join together on campus in support of UWiB. 184 people joined us for this special evening last year, including UWiB members and volunteers, UW faculty and staff, professionals from the Seattle business community, friends, family. We will be honoring UWiB Woman of the Year 2019 , Ingrid Russell-Narcisse. Ms. Russell-Narcisse is the Director of Corporate business for the Mariners. We also honored, Marie Bentler, the recipient of our $4,000 Paving the Way scholarship. Thanks to the generosity of several Pacific Northwest businesses and the hard work of our members for last year's event, UWiB procured 93 items and 23 desserts as donations for our silent auction and dessert dash. The event raised over $20,000 for our endowed scholarship fund! This was a record-breaking amount and will allow us to increase our scholarship award to $6,000. Achieving this milestone would not have been possible without all who attended, our amazing volunteers, and especially our incredible sponsors. 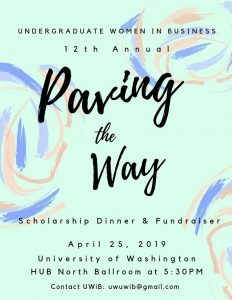 The 11th Annual Paving the Way Scholarship Fundraiser was a huge success, and it helped us come one step closer to reaching our goal of one day fully funding a UWiB member’s annual tuition. We are looking forward to another great success with the 12th Annual Paving the Way Scholarship Fundraiser. Thank you to all of the companies that donated items and desserts to our Silent Auction and Dessert Dash! 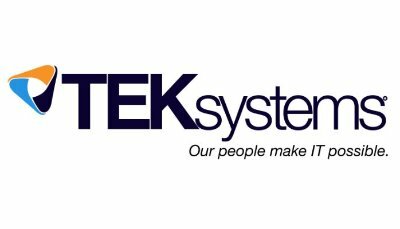 Click here to see a complete list of our generous donors. Click here to purchase your ticket(s) for the 12thAnnual Paving the Way Fundraiser. Click here to see the photos of 11th Annual Paving the Way Fundraiser.